The Green Issues Working Group is charged with identifying and facilitating state party action on external Green issues not already delegated to another Committee or Working Group. • Build coalitions with other organizations working on Green issues. Any Green Party member can participate in the Green Issues Working Group (GIWG). 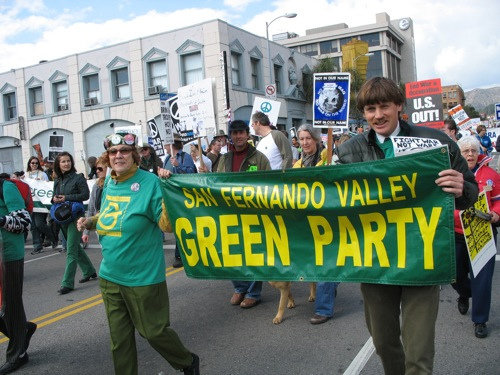 The GIWG meets by phone and in person at Green Party of California General Assemblies. Working group members earn voting privileges when they attend at lease two working group meetings within two years. There is also a GIWG email list open to registered Greens in California. Subscribe at http://lists.cagreens.org/cgi-bin/mailman/listinfo/green-issues-wg. For more information, contact GIWG co-coordinators April Clary and Alex Shantz. You may also contact Jesse Moorman, Coordinating Committee liaison and Dorothy Kemeny, alternate co-coordinator.